We're improving the busy 6.5 mile (10.5km) stretch of the M20 between junction 3 at West Malling and junction 5 at Aylesford by upgrading it to an all-lane running smart motorway. 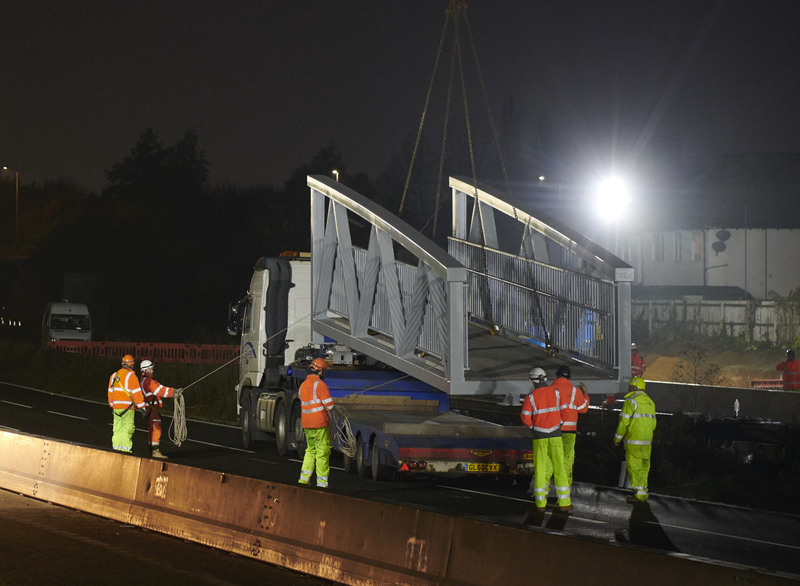 Teapot Lane Footbridge was installed on the weekend of 16/17 November 2018, with the motorway re-opening before midnight on Saturday 17 November, more than 24 hours ahead of schedule. We know that our work and the associated closure caused disruption to both neighbours and road users, and we thank everyone for their patience. During the start of 2019, motorway verge clearance work along the scheme continues. 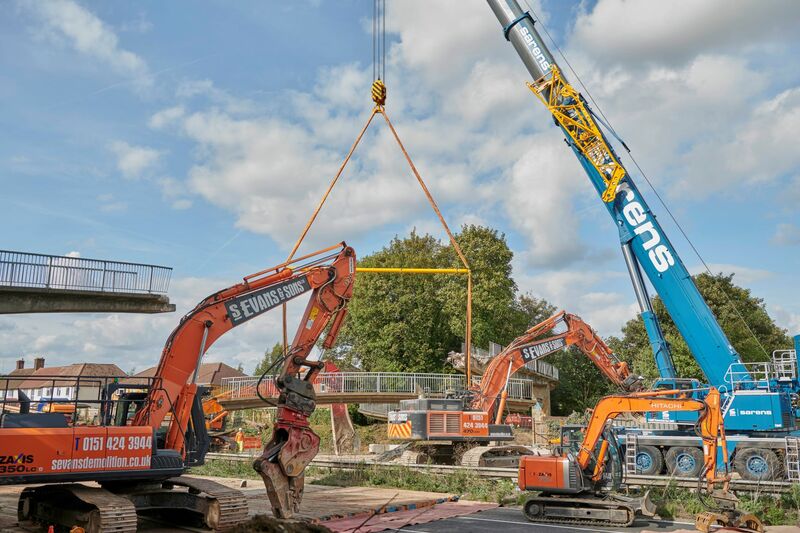 The most visible work has been the removal of seven redundant gantries and work to prepare for emergency refuge areas, new gantries, and other structures. To maintain three lanes and create space for our road workers we've installed narrow lanes and a 50mph speed limit. Our diversion routes have been approved by Kent County Council and Medway Council. Maps of these routes are available below. The consultation for the implementation of Variable Mandatory Speed limits on the M20 between junctions 3 and 5 was undertaken between 1 and 31 March 2018. The summary of comments received and our responses can be found in the consultation report in the Media & Documents section below. We finalised the scheme design and enabling works started in March 2018 in partnership with our delivery partner, Kier. This involved establishing a site compound at Castle Way, Leybourne, which is now operational. We held public information exhibitions and events between September and January 2017 and in April, May and July 2018 to inform the public about the scheme and answer any concerns about the upcoming works. Construction in the motorway verge includes: replacing drainage pipes, installing new lighting in parts of the scheme and cabling, building emergency refuge areas, installing new noise barriers, installing new gantries and taking down obsolete ones and resurfacing lane 1 between junctions 3 and 5. Over the next few weeks piling works and construction of the walls for the emergency areas will be taking shape. New gantries are due to be installed in April/May 2019. For information on road closures check the roadworks feed. When the work in the verge is complete, we'll move to the central reserve where work will include: removing the metal fencing and replacing this with a solid concrete barrier and resurfacing lane 4 between junctions 3 and 5. The scheme is expected to be completed by March 2020. In 2019 we'll be working with two chosen charities to deliver a number of community projects - Air Ambulance Kent Surrey Sussex and the Samaritans of Maidstone - as well as supporting local schools and colleges with STEM work and apprentice/careers advice. We’ll also be looking to hold further public exhibitions to update local residents and stakeholders on the progress of the scheme towards the end of the year. 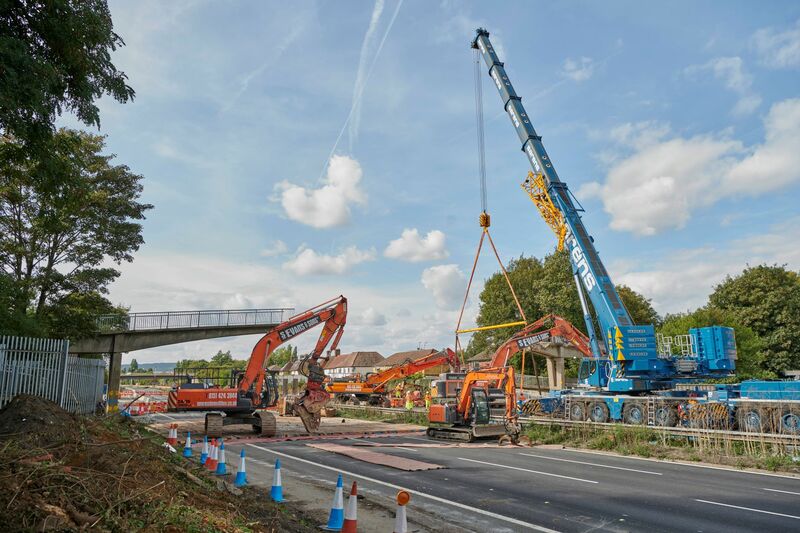 Upgrading the M20 to a smart motorway involves installing a lot of technology and infrastructure as well as converting the hard shoulder to a permanent driving lane. Between January 2019 and March 2020 construction work will include; installing new gantries that display travel information, lane availability and variable speeds when necessary; new drainage; and additional noise barriers in some areas. 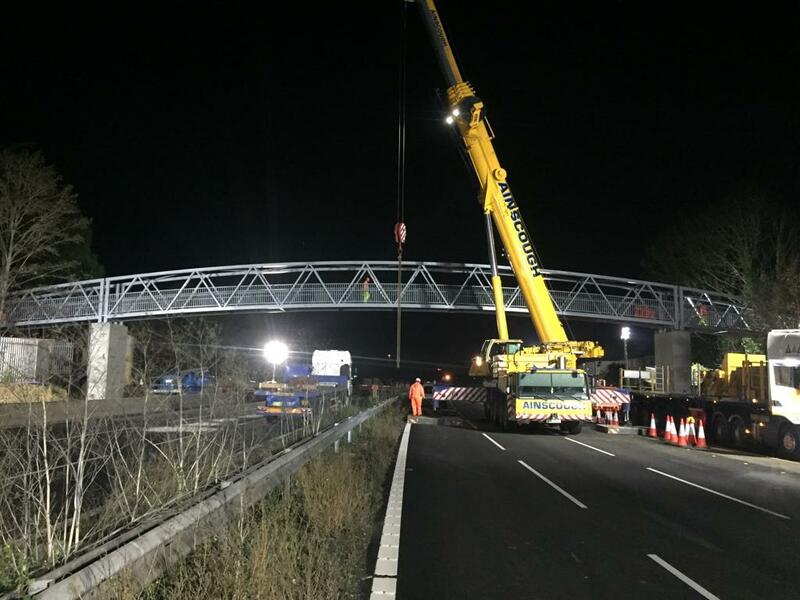 If you live close to the motorway you're likely to hear and see the work we're doing, and sometimes this work will need to take place at night, as well as during the day. If you'd like us to come and present to a local group, please drop us a line at: M20.J3-5Smart@highwaysengland.co.uk. The M20 junctions 3 to 5 forms part of a principal route that provides key links via Dover and Channel Tunnel to and from mainland Europe. As such, it facilitates national, regional and local travel, and regeneration and growth. Furthermore, the route provides critical access via the M26/M25 to London, the airports of Heathrow and Gatwick and to the wider South East, South West and the Midlands. The M20 at junctions 3 to 5 currently suffers frequent delays due to the volume of traffic. This scheme will provide greater traffic capacity and more reliable journey times by improving the flow of traffic. 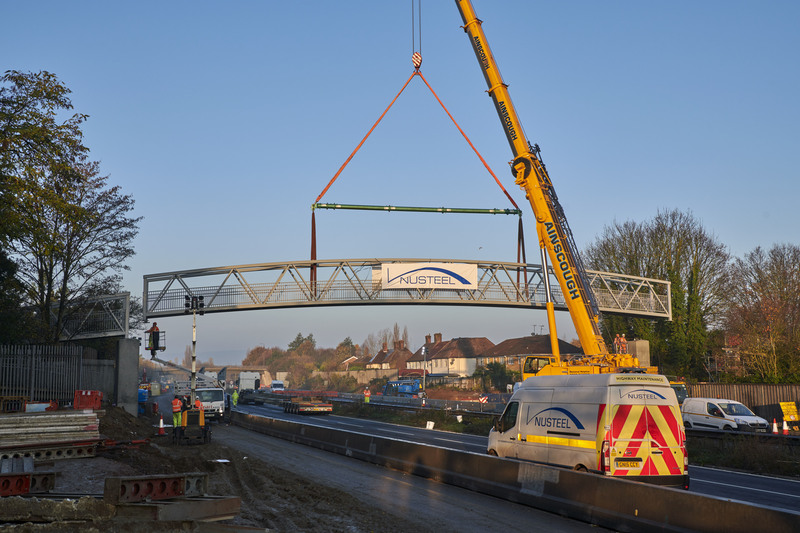 We're converting a section of the M20 into a smart motorway. Smart motorways use the latest technology to improve journeys by sensing traffic flow and setting speed limits accordingly to keep traffic moving smoothly, instead of continually stopping and starting. The smart motorway design for the M20, between junctions 3 and 5, involves converting most of the hard shoulder permanently to a traffic lane to create much-needed extra capacity to support economic growth. There will be more gantries and electronic road signs on the motorway to give information about road conditions and speed limits to help smooth the flow of traffic. The proposed scheme will enable proactive management of the M20 carriageway, including the link roads from/to the M26 at junction 3 (the junction with the M26) to junction 4, including the junction 4 east-bound off-slip and west-bound on-slip. It will also extend the existing variable mandatory speed limit to encompass the current hard shoulder between junction 4 and junction 5, including the junction realignments at junctions 4 and 5. As the hard shoulder will be converted into a fourth lane, we'll be installing emergency refuge areas. On this stretch of smart motorway, the distance between safe places will be approximately 1950m. This includes both emergency areas and hard shoulder where available. For further information on driving on smart motorways, please view our guide: How to drive on a smart motorway. Because we're working within the highway boundary and our environmental studies so far indicate that air quality and noise impacts are not significant, we don't believe anyone will be entitled to compensation. Details on our compensation policies are available on the Highways England website. We reinstalled Teapot Lane Footbridge on the weekend of November 16/17 2018. 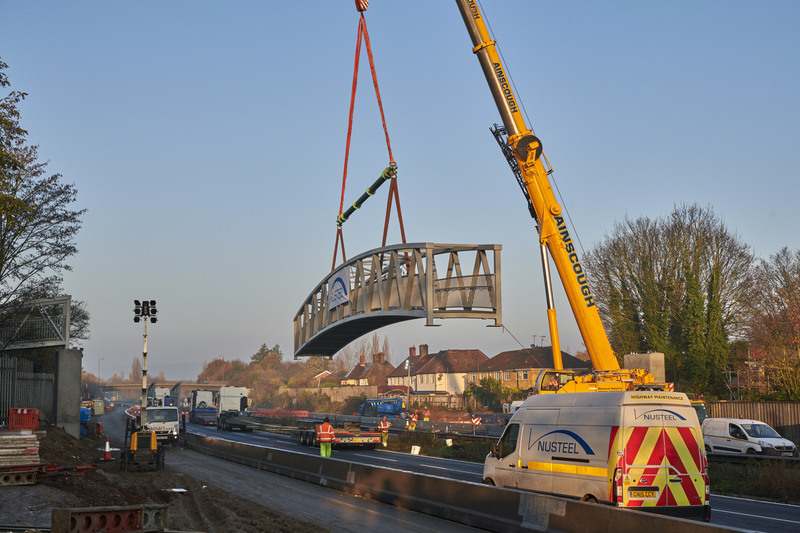 Following our post-installation construction work and safety checks, the footbridge is now open. For the M20 junction 4 to 6 closure see the diversion route below. For travellers starting their journeys outside Kent and heading for the coast, please use the M2 and then the A229. A smart motorway uses technology to actively manage the flow of traffic. The technology is controlled from a regional traffic control centre. The control centres monitor traffic carefully and can activate and change signs and speed limits. This helps keep the traffic flowing freely. For more information, please visit our Smart Motorway guidance pages. We've undertaken an environmental assessment that covers topics including noise and vibration, air quality, ecology and visual impacts. The report can be found in our Media & Documents section. The overall conclusion using specified guidance regarding the effect of the proposed scheme is that there would be no significant adverse effect on local air quality. Assessments shows that there will be no exceedance of the annual mean nitrogen dioxide (NO2) UK Air Quality Strategy objective in the future year (2019) with or without the proposed scheme. There is not expected to be a compliance risk due to the scheme. Trend analysis from continuous monitoring sites indicated that there were statistically significant downward trends in annual mean NO2 concentrations in the area. During construction, significant daytime noise impacts during the proposed construction works are not anticipated at neighbouring properties, based on the likely worst-case noise predictions undertaken. We've carried out surveys for protected species, including dormice, adjacent to the motorway. Mitigation work will be undertaken within Natural England licenses. The vegetation clearance has to be undertaken at certain times of the year to minimise disruption to wildlife. We'll retain existing screening planting where possible and propose additional planting upon completion of the scheme to minimise views of the motorway and associated equipment. We're installing new environmental barriers in highly residential areas to minimise noise effects. The type is dictated by what is needed at each location; reflective barriers push noise back across the source (away from residents) and into the atmosphere. Absorptive barriers take in noise, reducing the noise energy that reaches residents. Both types of barriers reduce the amount of noise reaching the residents. Between junctions 3 and 4 all lanes will be resurfaced with low noise surfacing. Between junctions 4 and 5 the carriageway was resurfaced in 2017, so in this area lanes 1 and 4 will be resurfaced. We need to keep three lanes running on the motorway in peak hours, and therefore need to undertake significant amounts of works at night. 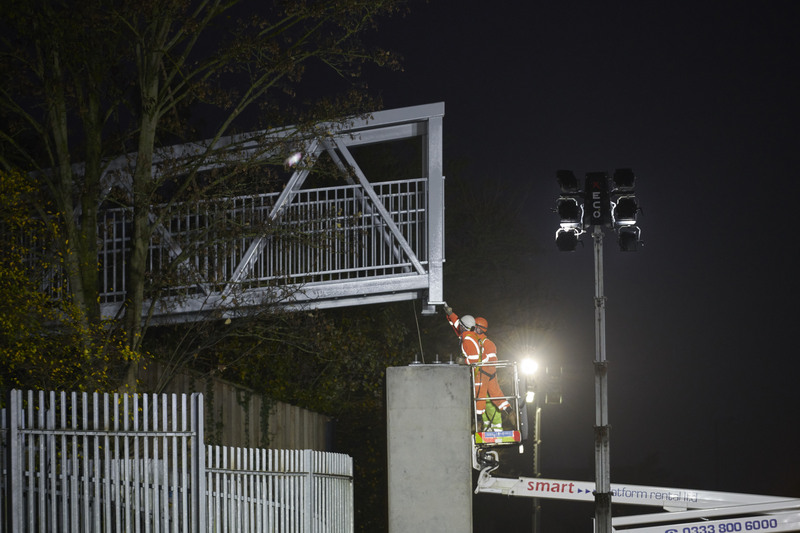 Examples of night work include gantry removal and installation, and resurfacing. Wherever possible, the noisier operations will be undertaken during the day. If the work we’re planning to do means we have to move or extend the traffic management (for example if we need to close additional lanes), then it will be undertaken at night. We'll make every effort to limit the time taken on this type of work. Location : The M2 eastbound between junctions J4 and J5 . Lane Closures : The hard shoulder is closed. Reason : Roadworks. Status : Currently Active. Period : expect disruption until 20:00 on 31 May 2019. Location : The M2 eastbound between junctions J3 and J5 . Reason : Roadworks scheme. Status : Currently Active. Period : from 08:00 on 8 April 2019 to 20:00 on 31 May 2019. Location : The A2 eastbound entry slip from the A227 . Lane Closures : Lane one will be closed. Reason : Roadworks are planned. Status : Pending. Schedule : Expect disruption everyday between 20:00 and 06:00 from 30 April 2019 to 4 May 2019. Schedule : Expect disruption everyday between 20:00 and 06:00 from 7 May 2019 to 10 May 2019. Lanes Closed : All lanes will be closed. Location : The A2 westbound exit slip to the A227 . Lane Closures : Lane one will be closed. Reason : Roadworks are planned. Status : Pending. Schedule : Expect disruption everyday between 20:00 and 06:00 from 29 April 2019 to 1 May 2019. Schedule : Expect disruption everyday between 20:00 and 06:00 from 14 May 2019 to 16 May 2019. Schedule : From 20:00 on 20 May 2019 to 06:00 on 21 May 2019. Lanes Closed : All lanes will be closed. Location : The A2 westbound between the M2 and the junction with the A2260 . Lane Closures : Lanes 1, 2 and 3 will be closed. Reason : Roadworks are planned. Status : Pending. Schedule : From 20:00 on 26 April 2019 to 06:00 on 27 April 2019. Schedule : Expect disruption everyday between 20:00 and 06:00 from 29 April 2019 to 4 May 2019. Schedule : Expect disruption everyday between 20:00 and 06:00 from 6 May 2019 to 10 May 2019. Lanes Closed : There will be three of four lanes closed. Location : The A2 eastbound between the A2260 and the junction with the M2 . Lane Closures : Lanes 1, 2 and 3 will be closed. Reason : Roadworks are planned. Status : Pending. Schedule : From 20:00 on 26 April 2019 to 06:00 on 27 April 2019. Schedule : Expect disruption everyday between 20:00 and 06:00 from 29 April 2019 to 4 May 2019. Schedule : Expect disruption everyday between 20:00 and 06:00 from 6 May 2019 to 10 May 2019. Lanes Closed : There will be three of four lanes closed. Location : The A2 westbound entry slip from the A227 . Reason : Roadworks scheme is planned. Status : Pending. Schedule : From 20:00 on 26 April 2019 to 06:00 on 21 May 2019. Location : The M20 eastbound between junctions J1 and J7 . Reason : Roadworks scheme is planned. Status : Pending. Schedule : From 20:00 on 27 April 2019 to 06:00 on 24 July 2019. Location : The M2 eastbound between junctions J2 and J3 . Reason : Roadworks are planned. Status : Pending. Schedule : Expect disruption everyday between 07:00 and 19:00 from 29 April 2019 to 3 May 2019. Schedule : Expect disruption everyday between 07:00 and 19:00 from 6 May 2019 to 9 May 2019. Location : The M2 westbound at junction J2 . Lane Closures : Lane three will be closed. Reason : Emergency barrier repairs are planned. Status : Pending. Schedule : From 21:00 on 29 April 2019 to 06:00 on 30 April 2019. Lanes Closed : There will be one of three lanes closed. Location : The M20 eastbound between junctions J8 and J9 . Lane Closures : Lane one will be closed. Reason : Emergency barrier repairs are planned. Status : Pending. Schedule : From 21:00 on 30 April 2019 to 06:00 on 1 May 2019. Lanes Closed : There will be one of three lanes closed. Location : The M2 eastbound between junctions J2 and J3 . Lane Closures : Lane one will be closed. Reason : Emergency barrier repairs are planned. Status : Pending. Schedule : Expect disruption everyday between 20:00 and 06:00 from 29 April 2019 to 1 May 2019. Lanes Closed : There will be one of four lanes closed. Location : The M2 westbound at junction J2 . Lane Closures : Lane three will be closed. Reason : Emergency barrier repairs are planned. Status : Pending. Schedule : From 20:00 on 26 April 2019 to 06:00 on 27 April 2019. Lanes Closed : There will be one of three lanes closed. Location : The M2 westbound between junctions J3 and J2 . Lane Closures : Lane three will be closed. Reason : Emergency barrier repairs are planned. Status : Pending. Schedule : From 21:00 on 29 April 2019 to 06:00 on 30 April 2019. Lanes Closed : There will be one of four lanes closed. Location : The M20 eastbound between junctions J8 and J9 . Lane Closures : Lane three will be closed. Reason : Emergency barrier repairs are planned. Status : Pending. Schedule : From 21:00 on 1 May 2019 to 06:00 on 2 May 2019. Lanes Closed : There will be one of three lanes closed. Location : The M2 westbound between junctions J3 and J2 . Lane Closures : Lanes 3 and 4 will be closed. Reason : Emergency barrier repairs are planned. Status : Pending. Schedule : From 20:00 on 26 April 2019 to 06:00 on 27 April 2019. Lanes Closed : There will be two of four lanes closed. Location : The M2 eastbound at junction J3 . Lane Closures : Lane one will be closed. Reason : Emergency barrier repairs are planned. Status : Pending. Schedule : Expect disruption everyday between 20:00 and 06:00 from 29 April 2019 to 1 May 2019. Lanes Closed : There will be one of three lanes closed. Location : The M2 westbound between junctions J4 and J3 . Lane Closures : The hard shoulder is closed. Reason : Roadworks. Status : Currently Active. Period : expect disruption until 20:00 on 26 April 2019. Location : The M2 eastbound between junctions J2 and J3 . Reason : Roadworks scheme is planned. Status : Pending. Schedule : From 07:00 on 29 April 2019 to 19:00 on 9 May 2019. Location : The M2 westbound at junction J3 . Lane Closures : Lane three will be closed. Reason : Emergency barrier repairs are planned. Status : Pending. Schedule : From 20:00 on 26 April 2019 to 06:00 on 27 April 2019. Lanes Closed : There will be one of three lanes closed. Location : The M2 westbound at junction J3 . Lane Closures : Lane three will be closed. Reason : Emergency barrier repairs are planned. Status : Pending. Schedule : From 21:00 on 29 April 2019 to 06:00 on 30 April 2019. Lanes Closed : There will be one of three lanes closed. Location : The M2 eastbound between junctions J3 and J4 . Lane Closures : The hard shoulder is closed. Reason : Roadworks. Status : Currently Active. Period : expect disruption until 16:00 on 28 April 2019. Location : The M20 eastbound between junctions J8 and J9 . Lane Closures : Lane three will be closed. Reason : Emergency barrier repairs are planned. Status : Pending. Schedule : From 21:00 on 2 May 2019 to 06:00 on 3 May 2019. Lanes Closed : There will be one of three lanes closed. Location : The M20 westbound between junctions J6 and J1 . Reason : Roadworks scheme is planned. Status : Pending. Schedule : From 20:00 on 27 April 2019 to 06:00 on 7 September 2019. Location : The A2 eastbound between the A227 and the junction with the M2 . Lane Closures : Lane four will be closed. Reason : Emergency barrier repairs are planned. Status : Pending. Schedule : From 21:00 on 26 April 2019 to 06:00 on 27 April 2019. Lanes Closed : There will be one of four lanes closed. Location : The M20 eastbound between junctions J1 and J3 . Lane Closures : Lane one will be closed. Reason : Roadworks are planned. Status : Pending. Schedule : From 22:00 on 29 April 2019 to 05:00 on 30 April 2019. Lanes Closed : There will be one of three lanes closed. Location : The A2 eastbound between the A227 and the junction with the M2 . Reason : Roadworks scheme is planned. Status : Pending. Schedule : From 20:00 on 26 April 2019 to 06:00 on 10 May 2019. Location : The M2 eastbound at junction J3 . Reason : Roadworks are planned. Status : Pending. Schedule : Expect disruption everyday between 07:00 and 19:00 from 29 April 2019 to 3 May 2019. Schedule : Expect disruption everyday between 07:00 and 19:00 from 6 May 2019 to 9 May 2019. Location : The M26 eastbound between the M25 and junction J2A . Reason : Emergency barrier repairs are planned. Status : Pending. Schedule : From 09:30 on 29 April 2019 to 16:00 on 29 April 2019.